By 1978 the cost of the components of a calculator (the electronics, keyboard, display, and casing) was now very little. So it was possible to produce a calculator with specialist functions at no great cost by having a custom calculator integrated circuit manufactured, as in the Cutting Data Calculator here. Distinctive features: Has functions for metal cutting calculations. Display is 8 digits, blue VFD. Four functions, square root, and cutting data functions for metal working machines. Integrated circuit - Omron HD36115, in this example date coded 1978..
74 x 129 x 25 mm (2.9" x 5.1" x 1.0"). Made in Japan by Omron Tateisi Electronics Co. 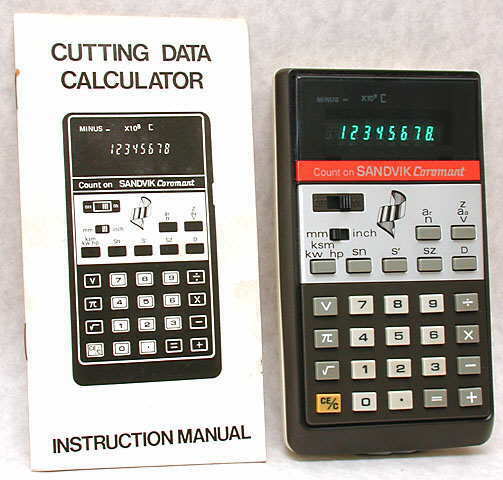 This specialist calculator was manufactured for the Swedish company Sandvik Coromant ("the world's leading manufacturer of cutting tools for the metalworking industry") by Omron, which sold a range of standard calculators under the Omron name. It employs a custom calculator integrated circuit and should be compared with the specialist calculators based on the Texas Instruments TI 58 calculator using custom memory modules.